Harmless Harvest® takes conscious steps to ensure the best quality of our products, the welfare of our people and the health of our planet. As a proud "ecosystem-based business," we make sure that everything we do benefits every entity involved – because even if it's a little harder, or takes a little longer, ultimately what's best for the people is best for the planet is best for the product. We harvest uniquely fragrant and tasty young, organic coconuts grown in Thailand. We share the welfare we create from plants to farmers, workers and partners all over. Using sustainable agriculture, we ensure a cleaner planet with 24% less plastic used. Harmless Harvest succeeded in obtaining the prestigious and exclusive Fair for Life - Social & Fair Trade Certification. Fair for Life is a certification that combines strict standards for social accountability and fair trade for socially responsible companies. It ensures that Harmless Harvest is committed to paying fair prices for goods like our coconut water, as well as supporting the well-being of local communities. 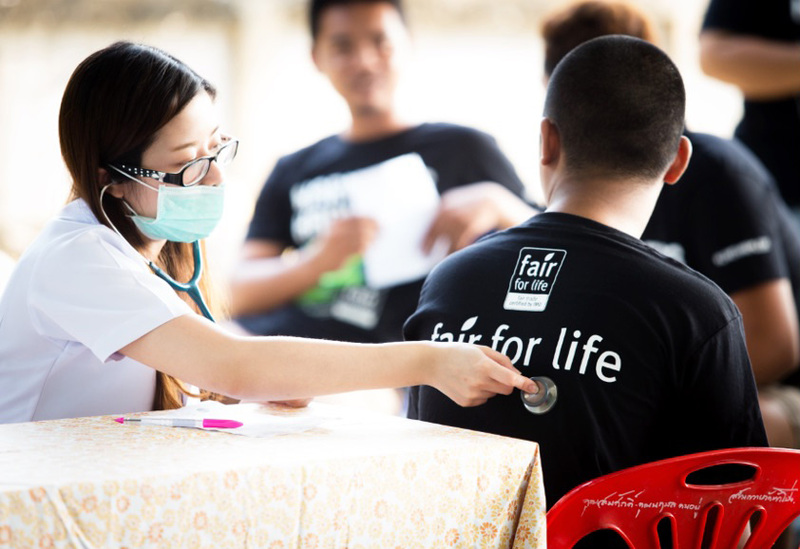 Through our Fair for Life commitment, we not only provide fair wages and assured well-being for everyone in our "chain of custody," we invest back into their communities. And we will not do business with any entity that has cut corners at the expense of its workers or the environment. The independent Fair for Life board conducts extensive, yearly audits to ensure we're continuing our pledge to Fair for Life principles. For every coconut purchased, a premium is collected and reinvested into the community under the leadership of a community committee. True impact is not measured instantly, it is measured over time. We believe capitalism can take two fundamental paths: constructive or destructive. Our generation is witnessing the results of destructive capitalism. Rooted in natural capitalism and deep ecology, our ecosystem-based business ethos builds upon change-seeking constructive initiatives. This model values and respects each person and community contributing to the creation and purchase of a product. It is understood that all stakeholders should benefit from Harmless Harvest, whether it be the plants at the source, the customer at the store, or any step in between. An ecosystem-based business model fosters the long-term welfare of all its participants from plant to purchaser. This approach relies on the investment of everyone involved, and likewise Harmless Harvest’s investment in them. • Capitalism does not have to be detrimental to the environment or the communities at the source. • Consumers should be given the best products. • Supply chains should be transparent and all agents in it should be held accountable. Organic certification is the only way to verify that the coconuts are never irradiated and are produced without genetically modified organisms (GMO's). Organic certification confirms food is produced without the use of persistent pesticides, synthetic fertilizers, or sewage sludge. These substances contribute to soil degradation and ocean dead zones.